Assistant Engineer (Agriculture Engineering) and Assistant Engineer (Tamil Nadu Fisheries Engineering Services). Online applications submission is available from 17-11-2017 to 16-12-2017. Application form will be accepted through TNPSC official website of www.tnspc.gov.in for this TN CESE Exam 2017. Candidates must have qualified B.E/B.Tech in relevant Engineering subject for applying this TNPSC CESE Exam 2017. Candidates will be selected for this vacancies through TNPSC Combined Engineering Services Exam, interview and records. 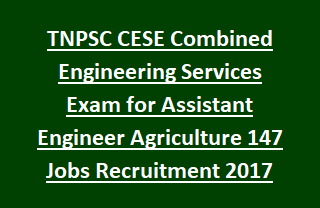 More details about this Assistant Engineer Jobs of TNPSC CESE Exam 2017 Notification is given below. As on 01-07-2017 For BCs, BCMs, SCs, SC(A)s, STs, MBCs/DCs and Destitute Widows of all Castes there is no age limit. For all other upper age limit is 30 years. There are total 147 Assistant Engineer vacancies in this Tamil Nadu Various Services. Service wise vacancy details are given below. Candidate must have qualified B.E/B.Tech Engineering in respective stream which he/she going to apply. Candidates will be selected through objective type written combined engineering services exam only. Further an interview will be conducted for CESE Exam qualified persons. CESE written exam will be conducted for 500 marks and consist of two papers. TNPSC CESE Paper 1 Exam Syllabus will be Degree level only. TNPSC CESE Paper 2 Exam syllabus will be degree standard only. CESE Paper 2 Exam duration is 2 hours and 200 questions will be given. Interested and qualified candidates who are within the age limits they can apply online for this TNPSC Combined Engineer Services Exam for Assistant Engineer jobs on or before 16-12-2017.